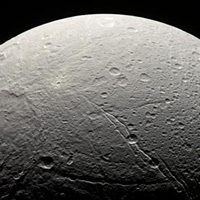 Dione [dy-OH-nee] is the twelfth of Saturn's moons. It was named after the mother of Aphrodite and Zeus in Greek mythology (Venus and Jupiter in Roman). 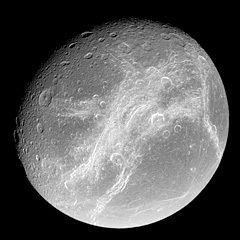 Dione was discovered in 1684 by Giovanni Cassini. Just about everything we know about this moon was learned from the Voyager encounters. Dione is the densest of Saturn's moons with the exception of Titan. It is composed mainly of water ice, but must contain a larger amount of rocky material than Saturn's other ice moons, Tethys and Rhea. 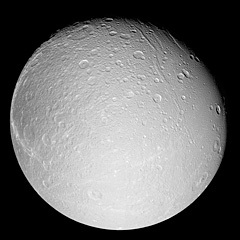 Dione is very similar to Rhea in composition, although somewhat smaller and much denser. 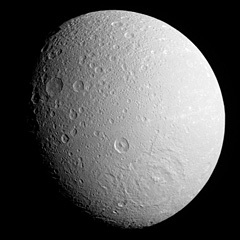 Dione is believed to have a rocky core with less ice coverage than Rhea. 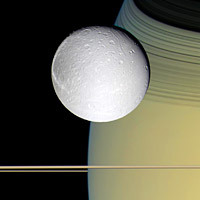 Dione is locked in a synchronous orbit similar to that of Rhea. This causes the same face of the moon to point towards Saturn at all times. 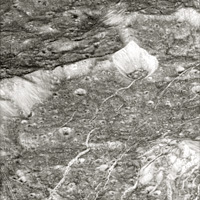 Dione has similar albedo features and terrain to that of its close cousin, Rhea. Dione's surface consists of heavily cratered areas, moderate and lightly cratered plains, and bright, wispy features. Most of the heavily cratered areas exist on the trailing hemisphere of the moon. Some of these craters exceed 62 miles (100 km) in diameter, while most of the craters in the plains areas are less than 18 miles (30 km) in diameter. The largest crater is called Amata and is 150 miles (241 km) in diameter. Like Rhea, these craters lack the high relief features seen on Mercury and the Moon. Heavy cratering would normally be expected on the leading edge of a tidally locked satellite. Since most of Dione's craters are located on the trailing hemisphere, astronomers believe that Rhea may have once been tidally locked with Saturn in the opposite orientation. Since Dione is relatively small, it would have only taken an impact leaving a 21-mile (35 km) crater to spin the moon around. With many craters on Dione exceeding 21 miles, it is possible that the moon has been spun around more than once throughout its long history. For many years, the origin of the the bright, wispy streaks was unknown. However, close-up observations by NASA's Cassini spacecraft revealed that these bright streaks are actually giant ice cliffs that are hundreds of meters high. It is believed that these cliffs were formed long ago by tectonic forces deep inside the moon.